How is Google doing trying to crawl and index my site? What search terms are driving most of the traffic to my site? What can I do to enhance the visibility of my key services and information within search? 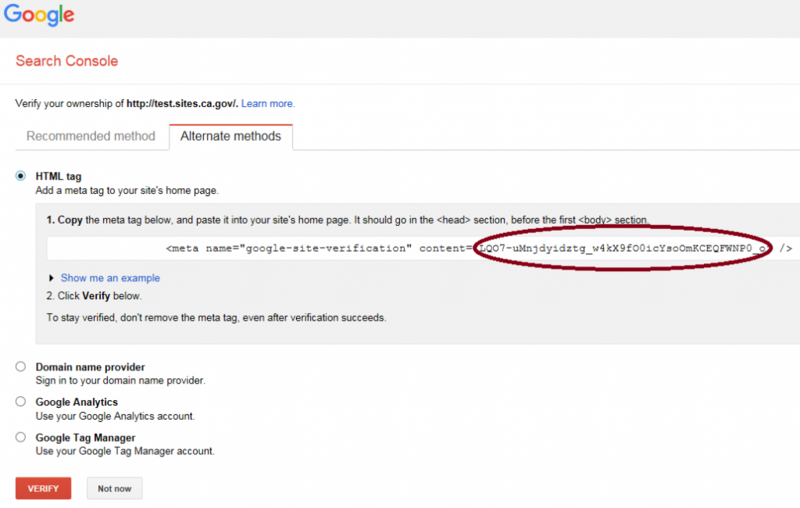 You must be logged into your Google account (preferably one used for only State business). HTML meta tag – if you are hosted on the CAWeb service, this is the method you would use. For CAWeb you will need to copy the meta tag from your Google Search Console, and extract out only the tag number (circled in red below – without the quotes around it). Then place it within the “CAWeb Options” settings for your website running within CAWeb, in the Google Meta ID setting. 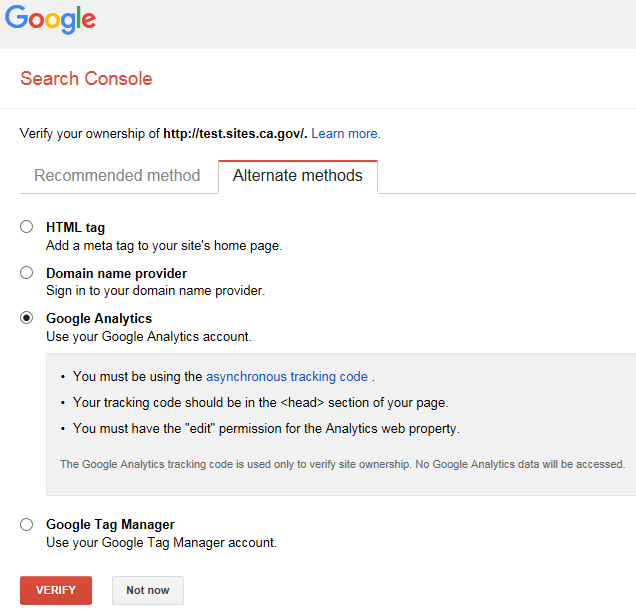 Note: click the red “Verify” button (shown also in the image below) once you have already saved the Google Meta ID setting within your site in CAWeb. Next you will need to click on the “Edit” link and then select your site to make it available to the Google Search Console for verification. Finally, you must go back to the Google Search Console and “Verfiy” your site. Once your have registered your site, if it has already been in existence for any length of time, you will find a wealth of information and insights into how Google, and the rest of the world via Goolge, finds your website’s information. A sitemap instructs the Google crawler in how to crawl your site. 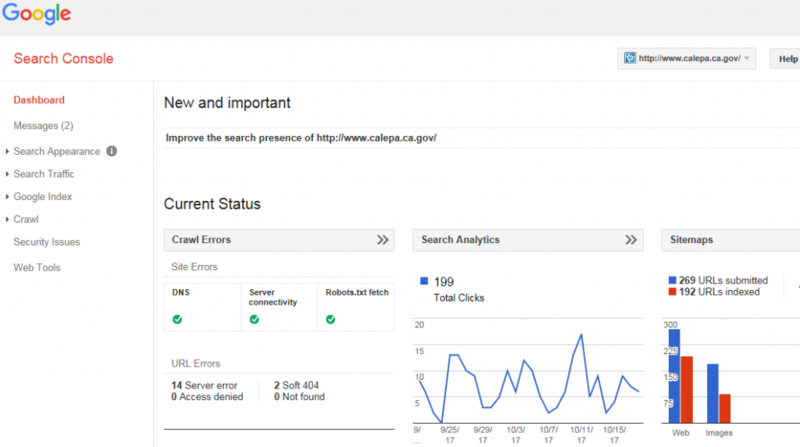 If your site is new, or has been recently redesigned or migrated to a new CMS (such as CAWeb), you should submit a new sitemap to Google to direct the crawler in how to index the new site. In most sites (such as those hosted in CAWeb) the sitemap file is located at the root of your site and is called sitemap.xml. To submit your sitemap to the Console: goto Crawl –> Sitemaps and then click on the red button “Add/Test Sitemap”. What you submit there is: sitemap.xml (see the image example below).